Old Hundred House B&B, Centerville, Cape Cod, Mass. 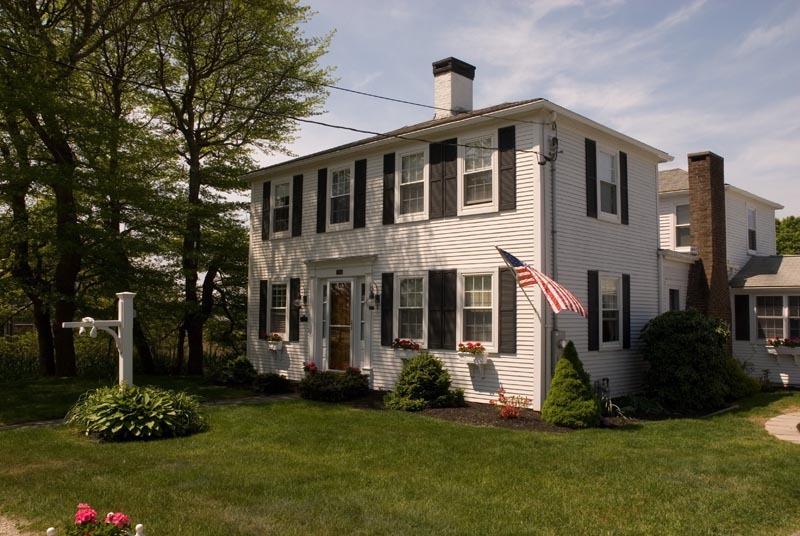 The Old Hundred House Bed & Breakfast is located in the historic shipbuilding community of Centerville in the Township of Barnstable on Cape Cod, Massachusetts. The B&B was built in 1820 as the home of Sea Captain Andrus Bearse. Near the great shopping offered by the towns of Osterville and Hyannis, and within walking distance of the award-winning Four Seas Ice Cream Shoppe, the Old Hundred House is ideally located. Link to Map. Steps from the pristine Craigville Beach, the waterfront guest house affords splendid views of the salt marsh from virtually every room, often punctuated with the call of the osprey. It is not uncommon to see kingfishers, cormorants or the great blue heron in the backyard. Come swim at the beach or relax on the screened in porch or the open deck. The hospitality of your Innkeepers, Conrad and Christine, will add to the enjoyment of your stay. The stately home was named "Old Hundred House" because Captain Bearse would sing or whistle the tune Old Hundred when walking from the harbor to the house, which still has the charm of yesterday with the conveniences of today. Inside, the accommodations range from rooms for one to five, all with central AC, Florida fans and almost all with water views. See our picture gallery for pictures of guest rooms, the grounds and views. Interesting details surprise each guest, but there are no rare antiques; young visitors are always welcome. A TV and DVD are available in the guest lounge, so bring your favorite movies for a rainy day. We have wireless internet access should you need it. Your hosts will be happy to direct you to local shopping, dining, sight seeing and whale-watching tours.